Senior Bailey Everett. Photo courtesy of McIntyre Imaging. The Girls Basketball team (7-3, 3-1) picked up a big Circle City Conference win on Tuesday night, rallying to defeat Heritage Christian (4-4, 2-1), 47-44. The win improves the Lady Warriors’ CCC record to 3-1, with their lone conference game remaining against Roncalli HS on January 18. CCHS overcame a slow start to the game and some early turnovers to the HCS pressure, to trail 13-10 at the end of the first quarter. The Lady Warriors fortified the defense in the second quarter, using a 10-7 scoring advantage to be tied at the halftime break. 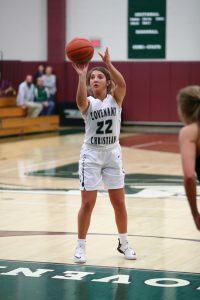 The Lady Eagles utilized points off of turnovers and a couple of big 3-pointers to take a 35-28 lead into the fourth quarter, but CCHS rallied back with a 19-9 advantage in the final frame to pick up the win. CCHS was 9-for-11 from the line, 5-for-6 in the waning minutes of the game, to help seal the win. Senior Bailey Everett scored a team-high 17 points. Sophomore Bonnie Lew Ludlow added 11 points, including three 3-pointers. HCS Sophomore Ariana Wiggins had a game-high 19 points, nine of which came from distance. Covenant is back on Andrew Smith Court Thursday night, as they host City Alliance foe Cathedral HS in a JV/V doubleheader at 6/7:30 pm. The varsity contest will be broadcast on Indiana SRN. Login in to listen to Jonathan Matthes and Brent Young bring you all of the action, starting with the pre-game show at 7:15 pm.